A common aviation problem is that of landing on a short run-way that has some kind of obstruction—like tall trees or power lines—near the runway threshold. 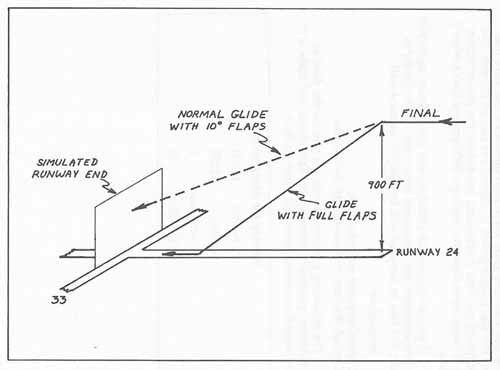 In such a situation, you may not be able to use a conventional landing technique—if you approach in the usual way with 10° flaps, a glidepath high enough to allow you to clear the obstruction might leave you too high for the runway, causing you to overshoot it. Under such conditions, you can use 30° flaps and a lower airspeed, so as to descend to the runway at a steeper-than-normal angle on final approach. This permits you to clear the obstruction, but you still touch down near the runway threshold. Although I'm not aware of any situations in which the simulator program actually provides such an obstruction near a runway, this short-field technique is worth practicing. It will help you any time you find yourself too high on a final approach, where a steeper-than-normal descent is necessary. And the procedure will enhance your ability to control the aircraft competently under varying conditions. In any event, it's a lot of fun to practice. Short-Field Technique. To practice the short-field landing technique, first get the airplane set up normally—with 10° flaps, flying straight and level at about 95 knots. Then, to begin the descent, ease back on the throttle. If the glide isn't steep enough with a 500fpm descent, throttle back further for 1000fpm—but watch your airspeed to avoid a stall. At this low airspeed, you're very close to a stall, so you have to monitor the airspeed indicator carefully. Use the elevator to control the airspeed, and use the throttle to control altitude and the rate of descent. If you get a stall warning, lower the nose to increase the airspeed. Simulated Short-Field Conditions. In order to try out this technique, set up a simulated situation at MacArthur using Runway 24. Maintain the traffic pattern altitude of 900 feet on your final approach, until you're about to actually cross the runway threshold. When you're just about at the runway threshold, throttle back and begin the descent. We'll also assume that Runway 24 actually ends about half way down, where it intersects Runway 33. Therefore, you'll try to be on the runway and stopped before you reach that intersection, as shown in Figure 2-7. Training Procedure. To try out this technique, take off on Runway 24 and remain in the pattern. Come around onto the downwind leg at pattern altitude of 900 feet, but then extend that downwind leg well beyond the threshold at the start of Runway 24; continue downwind about twice as far as you usually do, to give yourself time to get set up. First set up normally on the downwind leg, and then maintain traffic pattern altitude as you turn onto the crosswind leg and then onto a longer-than-usual final. Save the flight parameters at that point. Then, while on final and lined up with the runway, lower 30° flaps. Keep the nose under control, and end up in straight and level flight at 900 feet, with your airspeed at about 65 knots. (On the 68000, with gear down, you're airspeed is around 50 knots). Maintain 900 feet until you're coming in over the runway threshold, as if there was some sort of obstruction there; use the overhead radar view to determine when you reach that point, and then throttle back. The present aircraft configuration—with 30° flaps—will give you a steeper glide angle than otherwise, but note that you still use engine power to control the rate of descent. Use 500fpm if you find it adequate, but reduce the power further for a more rapid descent—perhaps 1000fpm—if that's what it takes. If you do descend at 1000fpm, add some power again just as you approach the pavement; otherwise, when you try to flare, the loss of airspeed will be likely to cause a stall. Control airspeed with the stick. Control the rate of descent with the throttle. The following parameters will put you on the field at MacArthur, parallel to Runway 24. Taxi ahead and make a U-turn onto the runway threshold, then go to it.